I don’t know what’s going on in the National League West, but it’s strange. With the Dodger’s 3-0 victory over the Rockies in Wednesday night’s series finale at Dodger Stadium means that the Dodgers are only 3.5 games back of first place. It might be a little too early to call the Dodgers contenders. After all they’re still 5 games under .500, and only 10-14 at Chavez Ravine. However with the Dbacks circling the toilet bowl and the Rockies looking beatable the Dodgers just might have a real chance to turn their season around, as they take advantage of a weaker division this year. The boys in blue have now won six of their last seven games. 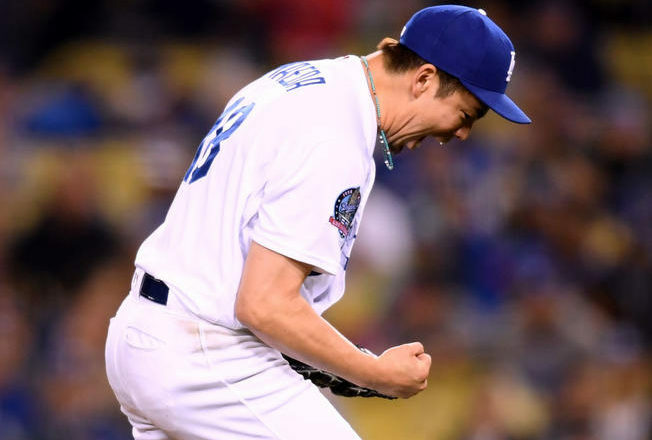 Marvelous Kenta Maeda twirled another masterpiece. Coming off his eight inning gem against the Marlins, he turned in another outstanding performance. The Japanese right hander tossed 6.2 shutout frames allowing just two hits and striking out 12. Maeda walked four and made 111 pitches. The Rockies were held to just three singles and four walks. Maeda picked up his fourth win of the season. The Dodger bats did their work against opposing left hander Kyle Freeland in the middle innings. They scored two runs in the fourth and another in the fifth to account for the three runs. In that fourth inning Justin Turner singled to center and one out later Enrique Hernandez singled him to second. Logan Forsythe’s ground-rule double that hopped over the short wall in the left field corner scored Turner to give the Dodgers a 1-0 lead. Yasiel Puig’s fielder’s choice grounder to short got Hernandez in to score for a 2-0 lead. Forsythe smartly distracted the Colorado infielders by getting caught in a rundown that allowed the run to score. In the bottom of the fifth, Chris Taylor walked and Austin Barnes’ grounder was flubbed by Nolan Arenado, but he was able to recover and retire Taylor at second base. After Turner singled Barnes to third, Matt Kemp’s sacrifice fly scores Barnes as Turner is thrown out at second base. Barnes crossed the plate just a hair before the tag at second and the Dodgers go up by a 3-0 score. That was all for the Colorado bats. The Dodger bullpen provided actual relief tonight. Pedro Baez got the final out in the top of the seventh inning. Scott Alexander pitched a scoreless top of the eighth inning and then the big man Kenley Jansen retired the side in the top of the ninth, pitching around a two-out single to record his tenth save of the season. The Dodgers win! For the record the Dodgers optioned right hander JT Chargois to Oklahoma City before the game and recalled left hander Edward Paredes. Paredes did not appear in the game. Notably Maeda was just one strikeout shy of his career high. His ERA now sits at 3.38. The Dodgers have now picked up five games in the National League West standings over the last week. What do you know? The Dodgers have won consecutive series. Oh and Clayton Kershaw threw a 54-pitch bullpen session and may be just days away from returning. Things are starting to look up. The Dodgers will take a scheduled day off on Thursday before the Padres come into town for the weekend. The red-hot Ross Stripling takes the mound against Clayton Richard on Friday night in the series opener. If Maeda continues to pitch like this, I will take him off my ‘suspect’ list. 2 in a row is good. I look for consistency with him. He usually blows it early. Pitching surely made the difference tonight. The Dodgers can’t seem to generate more than 6 hits. I guess it’s better than 3 hits especially if there are some rbi’s attached to them. The Rockies can’t seem to hit any better. You’re right Scott, the West is weak this year. Very surprising change from last season. This is Dodgers baseball, my friends. Getting two runs home in two separate ROTLeTTO situations meant a 3-0 lead and way way less pressure on the bullpen. I dare say Kemp is turning into AGon as our sure RBI man, and Puig’s hitting is really looking up. I don’t think he’s struck out in a ROTLeTTO situation this year (though he’s still got his GIDP issues). But the TTOTBLANd downs helped as runs were scarce. I hope they keep it up! So as we’ve seen, when the Dodgers get good starting pitching, they tend to win games. The Dodgers seem to be short on good starting pitching this season, notwithstanding Maeda’s two good performances in a row. Ergo, the front office should target a solid starter for this year’s trade deadline acquisition. They had the right idea last season; they just chose the wrong pitcher. Hopefully their starting pitcher selection methodology has improved since last year. For some reason, I’m less concerned about the offense. Logically, CT, you would be correct. But the FAZ doesn’t use logic in the same way as you and I do. Their logic is muddled with algorithms that take the human element and complicate it with numbers/stats. They also have ‘plan’ concerning finances. They are cheap bastards, predators in a way, like catfish, eating what’s left on the bottom. They’ve made big mistakes when they’ve spent money. Odd, isn’t it? Most of their selections for rotational/positional players have bombed. Even getting Kemp was a kind of accident. I’m not so hopeful that this group can right itself. Pitching is the worry. Really need to settle the bullpen. If history is any gauge both the pen and rotation will be fine. Let’s hope history has resonance. “Never look back hosers. It’s not where you’re going.” Badgerdamus. “We spend a great deal of time studying history, which let’s face it, is mostly the history of stupidity.” Stephen Hawking. There is no present and there is no future. There is only the past over and over again now! That sounds more about what is going on in this time, where some are only putting out a bunch of lies, to actually prevent people from seeing, the actually truth. But most people know better, and knew better in November of last year, and will make it count in November, this year. Most people know better MJ, that is true. But they are the silent majority. Hopefully there has been a wake up call. Kinda like what is happening in the West. Arizona floundering is a very good thing. They had opportunity to put us about 15 games behind and blew it. Their losing Pollock is as big, or bigger, to them as our losing Seager. 3.5 back with 113 games to go. Still a chance. Colorado with a -28 run differential. Like I said earlier – pretenders. Ever heard of Chen-Chang Lee? 22.1 IP at AAA – 0.85 WHIP and 39 K’s. He’s 31. Lee Chen-ch’ang, (born October 21, 1986) is a Taiwanese professional baseball relief pitcher in the Los Angeles Dodgers organization. He previously played for the Cleveland Indians of Major League Baseball. He has also played for the Saitama Seibu Lions of Nippon Professional Baseball. Lee throws from a sidearm slot, and his fastball sits at 92–94 MPH and max out at 97 MPH. Are we going to see this guy play? We have 3 against the Padres. What the heck, now would be a good time to see if he can get ML hitters out. And regarding Santana. He’s 22. He’s a starter, yes, but some innings out of the pen on his regularly scheduled start day might be helpful. Or, why not let him start at home against the Padres? Let’s see what the kid can do. Is he on the 40? Uhh, nope. But that is a couple mouse clicks away. Wait, Santana is, Lee isn’t. Lee pitched a few times in spring training. He pitched in 4 games and had a 9.82 ERA. Probably one of the reasons he did not make the team. Machado rumors heating up again. But that makes sense since Duquette said he would wait until Memorial Day to see where the O’s were at. Some group on Twitter claims that the Dodgers are talking to them about Machado and Britton. Unless Baltimore is going to take on some salary, I doubt that this is anything more than a rumor. We all know FAZ is not going over the tax threshold and we all know that the O’s want Buehler and are not getting him. Maeda, with incentives, has made $10.4mm and $7.3mm. We’re a few million under the cap so if he pitches well, and we hope he does, there will be very little room to add salary. Machado makes $16mm. It would take some cooperation by both teams to get something done. If we expect them to help us stay under the cap, they have a right to insist on Buehler. If the shoe was on the other foot, we would. The question I have is, do you include Buehler? It is Machado we are talking about. Me? Sign an extension and I would do it. For a rental? I don’t think so. Machado is going to make bank next year. Where does he want to play? The market of course is limited. Only a few teams will be in on the bidding. We’re one of them. If we can keep him, I do it. We will have to see what we do against the Padres this weekend, because we have not been taking care of teams, like the Padres. But our starters have been pitching well lately, and Maeda did a really good job last night, to keep our starting pitching rotation, rolling. If Maeda can continue to pitch like he has, he is a very good number four, or possibly, a three. Because Maeda was really impressive last night, even in the few times, he had runners on base. An already pretty darn good OKC Dodgers roster gets even better today, as Matt Beaty and Edwin Rios join the team. Both had been down with injuries to start the season. Beaty was the 2017 Texas League MVP after slashing .326/.378./.505 with Tulsa last season. He’s a .311 career hitter. Rios combined to slash .309/.362/.533 between Tulsa and OKC last year, hitting 24 home runs with 91 RBI. Who had to go to make room for those guys? Did my dumb move of the month a little while ago. I am building a model of the Arizona, but making it to be my dad’s ship, The USS Nevada. BB-36. So I was getting ready to trim some parts with my X-acto knife and it fell off of my desk and as I went to catch it, I knocked it right into my leg…..went in pretty deep too…..lots of blood, no major artery’s hit and the EMT’s said I would live….no stiches, no harm, no foul, but one dumb move. You tried to catch a falling razor knife and stabbed yourself in the leg requiring an EMT call ….. and that’s only the dumb of the month? How the hell did you live this long?